A loss to Madison, A win over Triway. And someone is closing in on 500 points. Let's break it all down....TOGETHER!! Jekyll & Riders. What to make of the Riders so far....it's been some good, some bad. Flashes of a dangerous team, flashes of a "1 and done" team. A team that jumps to double digit leads, and then does not look too sure of how to play with a lead. ^^This is the same paragraph that was published a few weeks ago, I still think it applies. The Riders sit at 5-4 (3-2 in the OCC), losing a close OT game to Madison (our 3rd OT game of the season) and then posting a big home win over Triway. The Triway win snapped a 3 game losing streak (our longest losing streak since 2005-06). Riders travel to Lexington on Friday and then are home for a make-up game with Clear Fork on Saturday. Here's how the Canton district sits after games through January 18th. It's about the halfway point of the season and teams are starting to sort themselves out. I think it's a five or six team race. Tourney draw date is Sunday Feb. 8th. Here's a detailed breakdown of each team and their results so far. I'll put this link on the right hand side of the page for quick access. Minerva is the districts only undefeated team at 11-0, but I don't think the NBC will prepare them enough to play teams like Buchtel and St V.
Bonus Points: Zach has also crossed 200 rebounds for his career. School record for rebounds in a career is 782 by Marcel Denson (1992-96). Marcel's school records in points and rebounds will be real tough for any player to top, he played the equivalent of a season's worth of tournament games over his OHS career, basically an additional 20+ games of stats. Awesome find on YouTube.....the 1994 Div. 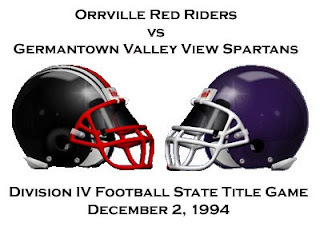 4 state title game between Orrville and the Spartans of Germantown Valley View. Click below to view the entire post, along with video clips. Grab a snack and your Rider cow bell. The '94 Riders were a well balanced team, strong on both sides of the ball and had a great mix of talent and skill. A lot was made of the junior class that season, and they were definately talented, but both lines were dominated by seniors, in my opinion the 2 classes complimented each other very nicely. They went 9-1 in the regular season, losing only to CCC (a DIII playoff team, by 7), and notched the first Orrville win at Wooster's Follis Field, 40-0. The Riders finished 2nd in Div. 4, Region 14, behind only Wauseon. Playoff wins over Clear Fork (at Wooster), Wauseon (at Findlay, snapping Wauseon's 25 game win streak) and Cleveland Benedictine (at Uniontown Lake) set up this state title match up with AP poll champion Germantown Valley View. It would be Orrville's 3rd appearance (and loss) in the state finals. 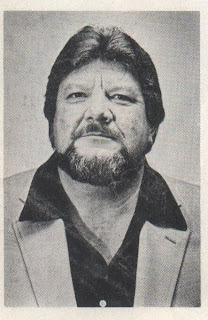 The Riders were coached by Bill McMillan, while the Spartans were led by Jay Niswonger. The video's were posted by Brandon Bowman, a senior guard on offense and lineman on defense....the clips are in high quality, so unless you have a real fast connection, may want to start the videos loading (hit the play button twice) and walk away for a few minutes. Trust me, the high quality is worth the wait. In this clip: It's a lot of band stuff...but notice the intro screen, they couldn't even spell our name right. The old one "R" spelling of Orrville. Also, notice the size of our band. Quite amazing compared to the current numbers. Lastly, notice the Massillon Turf...how many times has that been replaced since 1994? Has to be at least 3...maybe 4 times. No money in Massillon unless the football team has a need, then it grows on trees. In this Clip: #41 Jon Haley, #3 Kevin Maag, #14 Dan Stultz, #42 Marcel Denson, #65 Brandon Bowman, #22 Cory Wilson, #24 Bill George, #54 Chuck Brandon, #74 Tom Troyer, #78 Mike Moore. In this Clip: #25 Shane Hartzler, #7 Rhmeal Coleman, #23 Tom Reusser, #26 Renauld Ray, #12 Jared Zwick, #80 Jeremy Nawyn, #33 Chris Hostetler, #57 Brent Teague (not sure, but pretty sure), #64 Sean Ewing. In this Clip: Riders get on the board with a 42 yd field goal by Dan Stultz. Do you see how far that ball travels? It landed 5 rows from the top of the bleachers. Easily good from 50 yards....maybe more. Riders seem to be on the verge of a big play on offense or a big stop on defense numerous times, but just can't get the bounces....I guess that's the kind of day it would turn out to be. In this clip: Spartans score to go up 6-3. Nice shot of the Orrville sideline....who's that redhead? Matt Hamsher? A 2nd Rider turnover (and 2nd in Valley View territory) caps off the clip. In this Clip: Another Rider turnover (that's 3 for the half)...this time, the dreaded pick-6. Valley View's DB read it perfectly. 14-3 Spartans. In this clip: Mac riles up the troops. Are those wind pants or dress pants? Riders again turn the ball over, 4th time in the half. This time on a halfback pass by Tom Reusser. I know Tom wishes he could have that one back. He was one of the best (maybe the best) passing back we ever had, but Valley View had that scouted. In this clip: Another score by the Spartans puts the Riders down 21-3. Riders punt and Valley View tacks on one more, going 62 yds in :45 seconds, 28-3 Spartans. That one was big...21-3 was doable, but 28-3 against a team that knows how to run the ball, was going to be near impossible. That's basically the 1st half, why don't we let this one sit for a few days. I'll get to the 2nd half in a few days. Oh, here's the Marching Band of Style's halftime show (about 1:40 into the clip). Still can't get over the size of our band a mere 15 years ago. Well the holidays are over, it's been a few weeks, let's talk hoops. The Riders sit at 4-2 (3-1 in the OCC), coming off their first on-court loss over the weekend to Mansfield Senior. The Riders held a 16 point lead early, but couldn't put away the athletic Tygers, losing 64-62. 28 Orrville turnovers (not a typo) helped the Tygers in their comeback. The Riders jump back into action at Akron East tomorrow, then host Clear Fork on Friday 1/9. Canton District. Here's how the Canton district sits after games on January 3rd. Teams listed by order of record. Although both Buchtel and St. V have taken some losses, each team's schedule is very tough and will do more to prepare them for March than any other team in the district.